Stanley Black & Decker (SWK) was founded in 1843 and has grown into a diversified global provider of power and hand tools, engineered fastening products, and commercial security and monitoring systems. The company sells over 500,000 products including power drills, saws, toolboxes, wrenches, fasteners, measuring tools, compressors, nail guns, outdoor power equipment, sanders, lamps, mowers, vacuums, workbenches, polishers, grinders, cordless tools, air tools, and more. Some of the company’s biggest brands are Stanley, DeWalt, Black+Decker, Porter Cable, Bostitch, Irwin, Lenox, and Craftsman. 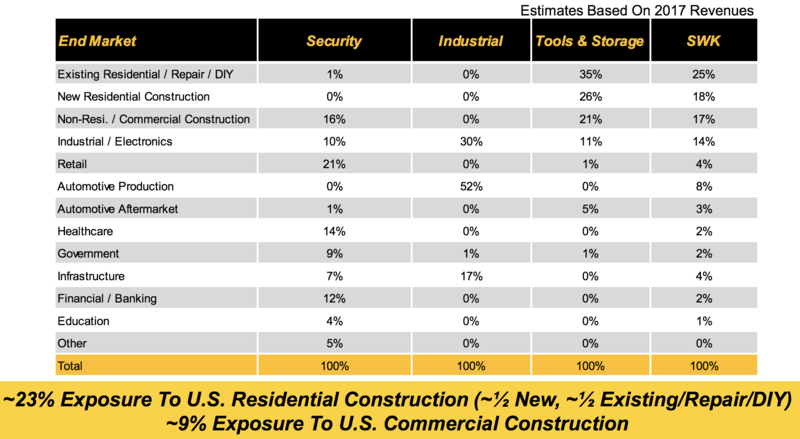 Stanley Black & Decker’s largest end markets in 2017 were focused on residential repair (25% of sales), new residential construction (18%), new commercial construction (17%), and industrial and electronic applications (14%). However, the company's products and services are used across a wide variety of industries. Tools & Storage (70% of 2017 revenue): power and hand tools, accessories, and storage products. Security (15% of 2017 revenue): designs, supplies and installs commercial electronic security systems and provides electronic security services, including alarm monitoring, video surveillance, fire alarm monitoring, systems integration and system maintenance. This segment also sells automatic doors to commercial customers. By geography, Stanley Black & Decker generated 54% of its 2017 revenue from the U.S., 22% from Europe, 14% from emerging markets, 5% from Canada, 3% from Japan, and 2% from Australia. The company sees emerging markets as its biggest long-term growth driver and has a goal of achieving over 20% of its total sales from those regions by 2022. With 50 consecutive years of annual dividend growth, Stanley Black & Decker is a dividend aristocrat and a dividend king. Stanley Black & Decker has managed to pay an uninterrupted dividend for 142 years and grow it every year for half a century. In other words, Stanley Black & Decker has several competitive advantages that have made it a great long-term income growth investment. The company’s primary advantages are its well-known brands, product innovation, global distribution channels and a strong management team. Stanley Black & Decker’s brands and reputation for quality were established a long time ago. The company obtained the world’s first patent for a portable power tool in 1916 and has since amassed an unparalleled family of brands, products, and industry expertise. Before going further, it’s worth mentioning that Stanley Works acquired Black & Decker in early 2010 for $4.5 billion to create the biggest toolmaker in the U.S. This deal combined the leader in consumer and industrial hand tools and security with the leader in power tools. As a result, Stanley Black & Decker has a strong portfolio of top brands which give it the No. 1 market share in global tools and storage and No. 2 position in commercial security systems. Overall, management estimates that the company has about 15% market share in the $59 billion global tool market, 6% more than the next closest competitor. Stanley Black & Decker’s extensive distribution channels and shelf space help maintain its leadership position in the industry. The firm's products are in practically every home center and mass merchandise retailer because they have loyal customers, cover the broadest number of applications, and are proven to sell. As you can see, the company's brands are positioned along different price points, targeting everyone from do-it-yourself consumers to professional contractors and industrial customers. Stanley Black & Decker's customers tend to be very brand loyal, valuing reliability and durability over price. Innovation has fueled the company's strong reputation with consumers and contractors alike. Stanley Black & Decker has over 13,000 active global patents and introduces about 1,000 new tool products per year. The company has noted that new products drive over 85% of its organic growth, underscoring their importance. Stanley Black & Decker is able to leverage its brand equity to enter adjacent product categories for easier expansion. Most of its markets are extremely large and fragmented because they require so many different types of products (e.g. a home remodeling project could require saws, measuring tools, nail guns, vacuums, tools, drills, and more). 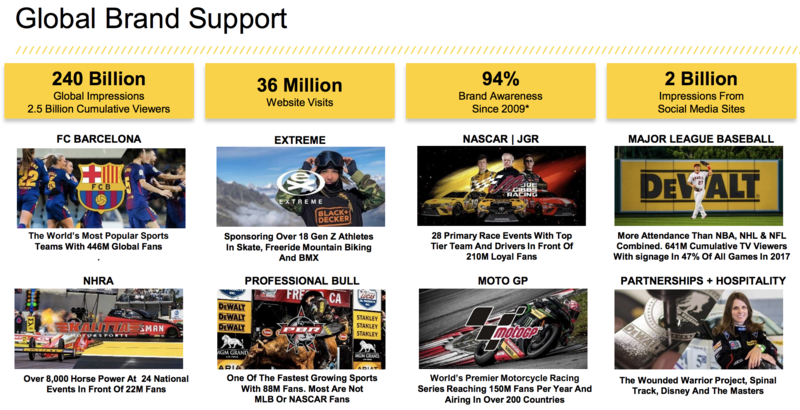 To maintain its strong brand awareness and reputation, the company continually invests in efficient marketing efforts such as prominent ad placement in sporting events favored by its core customer base (Nascar, soccer, MLB, and motorcycle racing). In 2017, the company estimates that people around the globe saw its advertisements a total of 240 billion times. Besides organic product development and savvy marketing, acquisitions have been a big source of the company's growth. In fact, Stanley Black & Decker invested over $10 billion in purchases of smaller rivals and brands since 2002. Recent deals include the $1.8 billion purchase of Newell Brands' tool business in 2017, the $900 million acquisition of the Craftsman brand from distressed retailer Sears Holdings (SHLD), and the $440 million purchase of Nelson Fastener Systems. The Newell Tools acquisition included the industrial cutting, hand tool, and power tool accessory brands Irwin and Lenox, which greatly expanded the company's global tools and storage businesses. Craftsman provided the company with the rights to expand Craftsman-branded products in non-Sears channels, and Nelson Fasteners was bought to grow the company's presence in industrial markets around the world. Over the long term, the company plans to return 50% of its free cash flow to shareholders (15% to 20% on buybacks and 30% to 35% on dividends) and use the other 50% on acquisitions. The company's disciplined capital allocation is part of what it calls its Stanley Fulfillment System, or SFS 2.0. SFS 2.0 is the company's lean manufacturing strategy and has five primary elements that work together: breakthrough innovation, digital excellence, commercial excellence, core SFS and functional transformation. Stanley Black & Decker essentially develops business processes and systems to reduce costs and improve the company’s return on capital. SFS 2.0 is at the heart of the company's 22/22 Vision, which has a goal of achieving $22 billion in revenue by 2022 (up from $13 billion in 2017) with enhanced margins due to improving cost controls and economies of scale. Those cost savings are largely expected to come from increased use of digital data via the internet of things, or IoT. Basically, Stanley Black & Decker wants to use numerous sensors connected to the internet to help it gather ever-larger quantities of real-time data pertaining to its supply chain and manufacturing processes. Using this information, the company can optimize its maintenance and repair schedules, as well as maximize the overall reliability and profitability of its manufacturing base. Management's 22/22 vision also calls for continued strategic acquisitions with a heavier focus on industrial businesses and brands because commercial clients tend to be more reliable sources of sales and cash flow than consumers. This is especially true of the commercial markets Stanley operates in, since it mostly offers solutions that generate stable and recurring revenue streams (e.g. software and monitoring services in its Security segment). With acquisitions expected to consume about half of incremental cash flow and drive at least half of the firm's incremental revenue growth for the next few years, maintaining a healthy balance sheet is very important. Fortunately, Stanley Black & Decker maintains an A credit rating from Standard & Poor's, helping the company borrow cheaply in order to execute on its growth strategy. Management has also committed to maintaining a target leverage ratio that is about in line with industry levels, which it expects will allow the company to keep its current strong credit rating despite fairly aggressive plans for acquisitive growth. Stanley Black & Decker's exceptional free cash flow generation and high profitability can help it quickly repay debt in the future as well. Thanks to its strong brands, sticky relationships with commercial and industrial customers, and large economies of scale, Stanley Black & Decker enjoys an operating margin near 13%, which is about double the industry average. 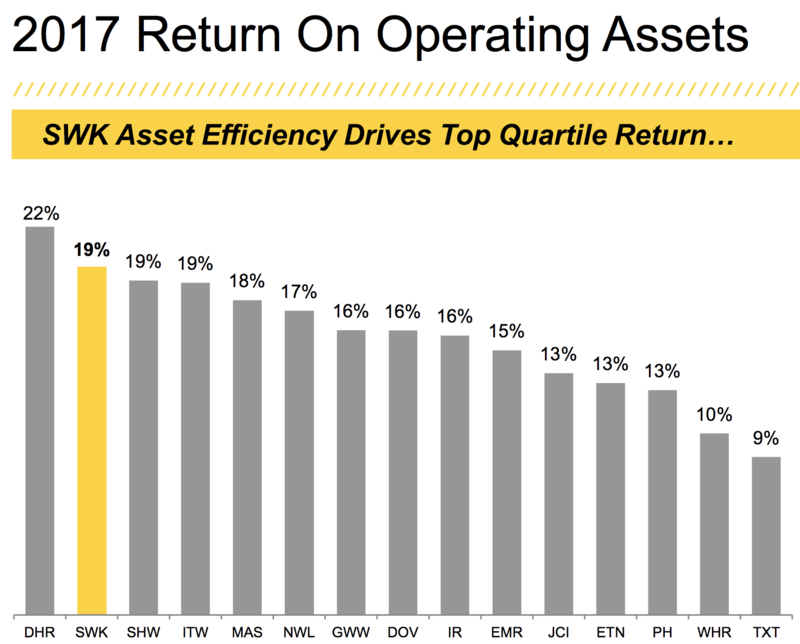 As you can see, Stanley Black & Decker is one of the most profitable industrial companies in the market with a disciplined management team that earns excellent returns on invested capital. The company's impressive operational efficiency is largely why Stanley Black & Decker was able to convert an average of 5% annual sales growth over the past five years into 10% growth in EPS and 11% growth in free cash flow. 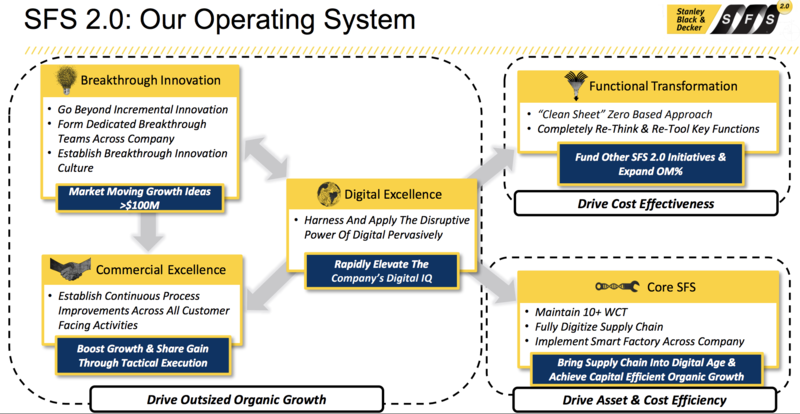 Looking ahead, management's long-term goal for the company is to achieve 10% to 12% annual sales growth, driven almost equally by organic expansion and acquisitions. More importantly, the company expects to at least maintain its current profitability, if not increase it. If successful, management expects the business to record 10% to 12% EPS growth. Given the firm's moderate payout ratio, Stanley Black & Decker's dividend will likely grow about in line with its EPS and free cash flow per share growth. In other words, the company has potential to deliver double-digit dividend increases for the foreseeable future. With strong brands and a well-diversified portfolio of products in slow-changing markets, it’s no surprise that Stanley Black & Decker has successfully been in business for more than 175 years. Most of the risks faced by the company are short-term in nature and related to macroeconomic trends, currency fluctuations, and raw material costs. Construction and remodeling projects are two major business drivers which tend to move in cycles, for example. Should the housing market unexpectedly roll over, there could be a buying opportunity for long-term investors. With nearly of of the company's revenue generated in international markets, foreign currency exchange rates can also affect the business. For example, management estimates that a 5% increase in the U.S. dollar relative to other major currencies would create a 2.5% growth headwind. Volatile commodity prices for important raw materials such as steel, zinc, copper, and resin can pressure short-term profitability as well. However, there don't appear to be any secular themes playing out that would necessarily challenge long-term demand for Stanley Black & Decker’s product offerings. If anything, the company’s capital allocation decisions are possibly its greatest risk. After taking several years off from major M&A to fix an underperforming security business, improve operational efficiency, and deleverage, Stanley Black & Decker has resumed its highly acquisitive strategy, earmarking half of its cash for deals. If management makes an untimely deal, takes on too much debt, buys a bad company, or unfavorably alters the company’s business strategy, the stock could suffer. For example, Stanley Black & Decker acquired European security company Niscayah in 2011. The business started losing customers throughout the integration process and forced Stanley Black & Decker to later miss earnings guidance. But the company has more often than not been quite successful in integrating the various businesses it has acquired over the years. Otherwise, Stanley Black & Decker’s continued branding and product innovation investments seem likely to continue serving it well across its large and fragmented markets. It’s also worth monitoring that customers could begin switching to lower-priced products, especially in emerging markets, but brand loyalty seems to be pretty high across most of Stanley Black & Decker’s product categories. Stanley Black & Decker has one of the best dividend track records an income investor will find. Few companies have existed for 175 years, much less paid a dividend for over 140 consecutive years. With continued product innovation and brand investment, Stanley Black & Decker’s brands seem likely to remain in demand for many years to come. The company will face its ups and downs depending on currency exchange rates and macro trends in key markets such as construction, but its profits will likely continue marching higher over long periods of time. While management’s rather aggressive acquisition plans pose some risks over the next five years, the company has earned the benefit of the doubt. Given its long-term prospects, strong balance sheet, and increasing exposure to emerging markets, Stanley Black & Decker appears to be a quality industrial holding to consider as part of a diversified dividend growth portfolio.